Casablanca Bar Black (P/N MF047B). The smell of leather, the intoxicating feel of rich wood, a..
Cirque Bar Cart (P/N F109). 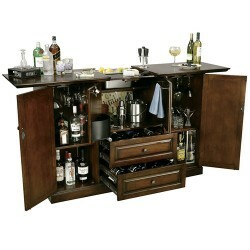 Two tiers provide space to pour and store libations, while clean m..
ell Bar Cart (P/N F400). The clean lines and smooth, warm-toned wood of our Howell Bar Cart fi..
Victoria Station Bar Cart (P/N F313). Practical and pretty glass shelves complement the dark i..